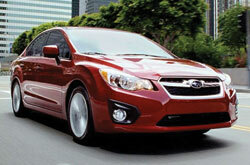 For many years the Subaru Impreza and Impreza WRX have been go-to cars in the compact sedan and hatchback segments. The Impreza, with its solid four-wheel drive system, refined interior and confident demeanor makes for an excellent and affordable family car, while the Impreza WRX is its speed-demon twin. For the new model year, the 2014 Subaru Impreza family sees minor updates like the introduction of a standard rearview camera on the Limited trim level, and the Aha Infotainment system for complete smartphone integration and easy access to your favorite apps, internet radio and more. Continue reading the Subaru Impreza review below to learn more about this legendary car and what's happening with this year's models. The 2014 Subaru Impreza and Impreza WRX are available in Kansas City in sedan and hatchback body styles, and buyers can choose from up to eight trim levels between each of the different models. 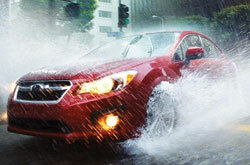 All Imprezas come standard with a 2.0-liter "boxer" engine that churns out 148 horsepower and 145 lb.-ft. of torque. Power is delivered to this all-wheel drive setup via a standard manual transmission or optional automatic CVT. On the flip side, Impreza WRX buyers in Kansas City will love the extra power delivered by its turbocharged 2.5-liter "boxer" engine. This setup delivers 265 horsepower and 244 lb.-ft. of torque to its all-wheel drive system. What's even more impressive is the WRX's 0-60 time: just 4.5 seconds. Our 2014 Subaru Impreza review showed that in addition to being attractive on the outside, it's equally attractive inside, too. Standard and optional features include: a sunroof, touchscreen navigation, the Aha Infotainment system, automatic climate control, cruise control, leather seats, auto headlights, full power accessories, keyless entry, and an audio system with USB/iPod integration and an auxiliary jack. 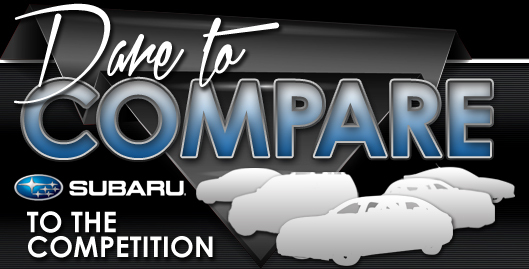 For even more stats and helpful information, including a walk-around video, continue reading the 2014 Subaru Impreza and Impreza WRX review below and contact Van Subaru, located in Kansas City, MO, on NW Vivion Road. In many key areas, the 2014 Impreza trumps contending vehicles like the 2014 Chevrolet Cruze, Volkswagen Jetta, Hyundai Elantra, Honda Civic and the Ford Focus. 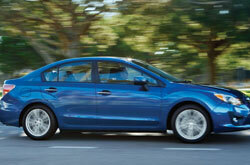 Shoppers will be smitten with the Impreza's marvelous looks, as well as its user-friendly features. Compare its price against the aforestated list of vehicles and you'll easily see that it's a fantastic value, which makes it a top choice for many Kansas City Subaru customers. Find out more information about what it offers in our bullet list below this text! We know your next Subaru purchase is important; that's why we've provided the 2014 Impreza review above, along with reviews of former models. Stop worrying about your next purchase; look to the reputable Impreza dealership in Kansas City for well-researched reviews composed by automotive enthusiasts. Information you can rely on to make smart decisions is right here - each overview is packed with helpful information and specs. After viewing Van Subaru's review of the new Impreza, contact us to make an appointment for a test drive and find out about limited-time dealership offers!